On 2007, the Ministry of Land and Resources certified a newly added oil-bearing area of 71.15 km2 in Nm-Ed1 reservoir of the Jidong Nanpu Oilfield (Structure 1 and Structure 2) in the eastern part of Hebei Province. This area has a proven oil reserve of 445.1 million tons, a technologically recoverable reserve of 94.9068 million tons and an economically recoverable reserve of 86.5863 million tons. Proven dissolved gas reserve of 53. 608 billion m3 was also added, with a technologically recoverable part of 11.172 billion m3. In addition to these certified reserves, PetroChina’s Reserve Management Committee has confirmed possible and probable reserves of 639.21 million tons. Up until now, the proven, possible and probable reserves of the Jidong Nanpu Oilfield has amounted to 1.18 billion tons. 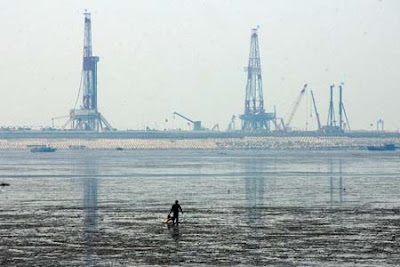 Geologically as the Nanpu sag in the northern part of the Huanghua depression of the Bohai Bay Basin, the Jidong Nanpu Oilfield is located in the city of Tangshan (the Caofeidian Port area), Hebei Province. During the 14 years since CNPC Jidong Oil Company began to develop the area in 1988, little progress was made. However, in September 2004, a high yield gas flow was obtained in old Nanpu Well 1 with an output of 700 m3 per day, marking the great discovery. Up till now, 76 exploration wells and appraisal wells have been completed, and 67 wells have been interpreted. Commercial oil flows are obtained from 30 of the 32 testing wells. And 5 oil-bearing structures have been discovered. The Jidong Nanpu Oilfield has tremendous reserves with the averaged oil layer thickness encountered in individual well up to 80 to 100 meters. Daily output per individual tested vertical well reaches to 80 to 100 tons and 200 to 500 tons per individual horizontal well. Its reserve abundance is 5.07 million tons per square kilometer. Its major target layers are buried at a depth of 1800 to 2800 meters, with favorable petrophysical properties and high oil quality. 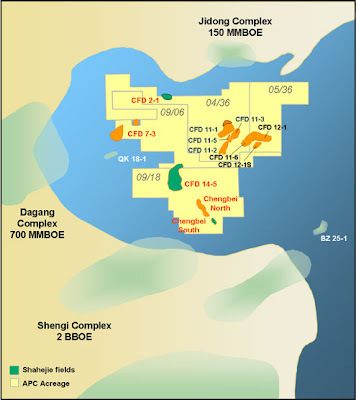 It is believed that the lately proven reserves of the Jidong Nanpu Oilfield equals to a half of the country’s yearly proven reserve newly identified over the past years. As PetroChina’s largest oil discovery in a decade, this progress will usher the 5th round of oil reserve peak in China, which is significant in securing China’s oil and gas supply. Meanwhile, the development of Nanpu Oilfield will give a boost to the social and economic development of Beijing, Tianjin, Tangshan, and even the Bohai Bay Rim.